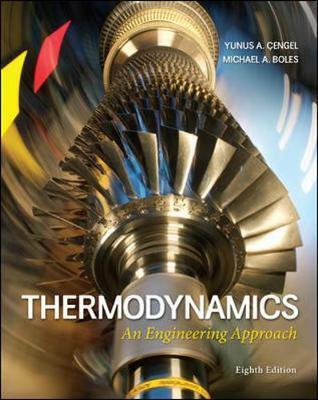 Thermodynamics, An Engineering Approach, eighth edition, covers the basic principles of thermodynamics while presenting a wealth of real-world engineering examples so students get a feel for how thermodynamics is applied in engineering practice. This text helps students develop an intuitive understanding by emphasizing the physics and physical arguments. Cengel and Boles explore the various facets of thermodynamics through careful explanations of concepts and use of numerous practical examples and figures, having students develop necessary skills to bridge the gap between knowledge and the confidence to properly apply their knowledge. McGraw-Hill is proud to offer Connect with the eighth edition of Cengel/Boles, Thermodynamics, An Engineering Approach. This innovative and powerful new system helps your students learn more efficiently and gives you the ability to assign homework problems simply and easily. Problems are graded automatically, and the results are recorded immediately. Track individual student performance - bt question, assignment, or in realtion to the class overall with detailed grade reports. ConnectPlus provides students with all the advantages of Connect, plus 24/7 access to an eBook. Cengel's Thermodynamics, eighth edition, includes the power of McGraw-Hill's LearnSmart a proven adaptive learning system that helps students learn faster, study more efficiently, and retain more knowledge through a series of adaptive questions. This innovative study tool pinpoints concepts the student does not understand and maps out a personalized plan for success. Yunus A. Cengel is Professor Emeritus of Mechanical Engineering at the University of Nevada, Reno. He has a BS in mechanical engineering from Istanbul Technical University and an MS and PhD in mechanical engineering from North Carolina State University. He served as the director of the Industrial Assessment Center (IAC) at the University of Nevada, Reno, from 1996 to 2000. He has led teams of engineering students to perform industrial assessments at numerous manufacturing facilities and has also advised various government organizations and corporations. Dr. i?engel is the author or coauthor of several widely-adopted textbooks published by McGraw-Hill. He is the recipient of many outstanding teacher awards and has twice received the ASEE Meriam/Wiley Distinguished Author Award. Dr. i?engel is a registered Professional Engineer in the State of Nevada; he is also a member of the American Society of Mechanical Engineers (ASME) and the American Society for Engineering Education (ASEE). New Page 1 Michael A. Boles is Associate Professor of Mechanical and Aerospace Engineering at North Carolina State University (NCSU), where he earned his Ph.D. in mechanical engineering and is an Alumni Distinguished Professor. Dr. Boles has received numerous awards and citations for excellence as an engineering educator. He is a past recipient of the SAE Ralph R. Teetor Education Award and has been twice elected to the NCSU Academy of Outstanding Teachers. The NCSU ASME student section has consistently recognized him as the outstanding teacher of the year and the faculty member having the most impact on mechanical engineering students. Dr. Boles specializes in heat transfer and has been involved in the analytical and numerical solution of phase change and drying of porous media. He is a member of the American Society of Mechanical Engineers, the American Society for Engineering Education, and Sigma Xi. Dr. Boles received the ASEE Meriam/Wiley Distinguished Author Award in 1992 for excellence in authorship.